In addition to our other microfiber cloths, we now include an Antimicrobial Microfiber Cloth for disinfecting your iPad, iPhone and computer keyboard. This cloth is treated to trap and eliminate over 99.0% of the bacteria on their surfaces. ANTI-STATIC, ALCOHOL, AMMONIA & SODIUM LAURYL SULFATE FREE. 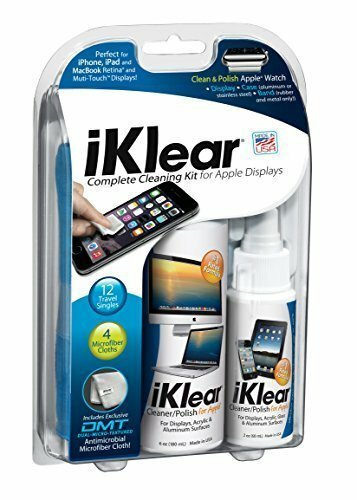 iKlear is the only cleaner recommended by Apple Tech Support and also used by Apple Care. Also clean your HDTV’s, Plasma Screen TV’s, all LCD displays, Digital Cameras and Camcorders, Cell Phones, PDA’s, GPS Screens, Automobile LCD Video Displays, Portable DVD Players, Scanners, CD’s, and DVD’s. If you have any questions about this product by iKlear, contact us by completing and submitting the form below. If you are looking for a specif part number, please include it with your message.